Zincite increases life force, courage, passion, creativity, will and personal power. It has an unusual and very potent energy. Most will feel this energy and make contact with it very quickly, when holding it in their hand. It is a powerful stone to assist you, if used for small periods of time, on a regular basis and this applies to all colors of this crystal. Zincite contains zinc, which is essential for cellular metabolism, teeth, bones, skin, and hair. It balances the thymus gland, immune system, and energy meridians of the body. It also helps detoxify and synthesize body, psyche, and soul. The availability for this crystal is sometimes difficult to find but is definitely a stone to add to your healing collection of resources. Light Green Zincite will energise the Brow Chakra and Crown Chakra to open you to high frequency energy, which it then brings back down to the lower chakras. Yellow Zincite will gently help relieve difficult menopause symptoms, and may help adjust to life changes which occur. 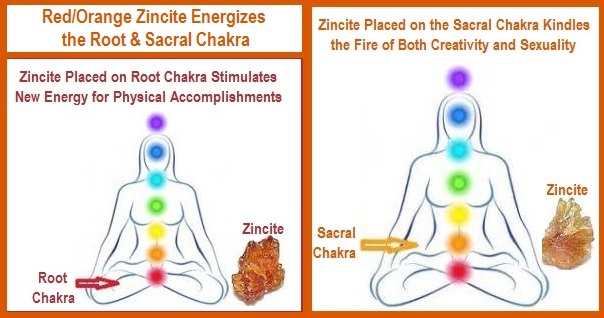 Remember when using Zincite as a helping healer, it can be a small stone.